This technical bulletin provides characteristics of various nozzles to enable the efficacious application of pesticides and to minimize particle movement to non-target organisms and soil. "What nozzle should I use?" That’s a complex question. And the answer to the question is becoming more complicated, especially with greater emphasis on tank-mixtures to deliver multiple effective pesticides against target pests. Some of the many nozzles on the market can reduce particle drift. Would these nozzles be right for you? 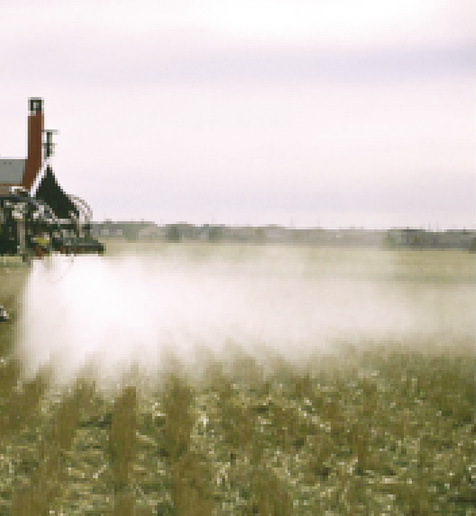 Whether a low-drift nozzle fits your program depends upon your spraying needs and operation. Drift-reducing nozzles typically produce larger droplets and penetrate the plant canopy when target plants are larger, but larger droplets may shatter and be lost to the soil surface when using contact pesticides and target plants are small. Nozzles that produce smaller droplets provide better coverage and the pesticide is retained better on the leaf surface, especially when the target plant is smaller. However, small droplets are more susceptible to particle drift. Which scenario is right for you? Probably a combination of both. Consider your priorities before making your nozzle choices. Nozzles are relatively inexpensive, but they can be the most important component of your spray system. Should you be concerned about particle drift? Are you using highly active or nonselective herbicides and herbicide-tolerant traits? Does the pesticide label specify nozzle selection and spray volume? Are you spraying near sensitive crops or sensitive areas (shelterbelts, neighboring fields, rural homes)? Does the label specify environmental conditions (wind speed, relative humidity and air temperature) when you will be spraying? Are you concerned about the effect of pesticide drift on the environment? The Environmental Protection Agency (EPA) has weighed in, creating a policy to encourage the development of spray technologies scientifically verified to reduce particle drift. To comply with policy, pesticide and adjuvant manufacturers will determine each new pesticide’s potential for drift, considering application ground speed, spray pressure, nozzle selection, pesticide, pesticide-mixture, adjuvant and wind speed. New pesticide labels will contain written guidelines for ensuring more of the applied pesticide reaches the crop and, thus, improving overall pest control and reducing the loss of pesticide from the target. Whatever nozzle you choose, the pesticide label is the law and always must be followed. You will be breaking the law if you elect to spray if a pesticide label prohibits application above a specific wind velocity. Be aware that drift-reducing nozzles only reduce particle drift; they do not eliminate all drift. Spraying when a susceptible crop is downwind still may cause damage. Drift-reducing nozzles do not reduce volatility. This publication summarizes characteristics of conventional and low-drift nozzle technologies, demonstrates the nozzle and includes an image on water-sensitive paper of the spray deposit it produces. The images were produced from nozzles with water volumes of approximately 8 gallons/acre for all nozzles at their standard or optimum pressure. Spot cards were sprayed lying on a horizontal surface and do not indicate coverage on an inclined or vertical surface. 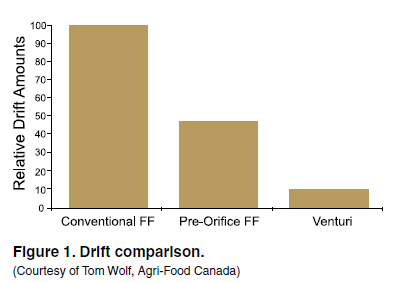 Figure 1 compares the relative drift produced from a standard flat fan, a pre-orifice flat fan and a venturi nozzle. The venturi nozzles shows about a 90 percent reduction in drift, compared with a flat-fan nozzle at standard pressures. 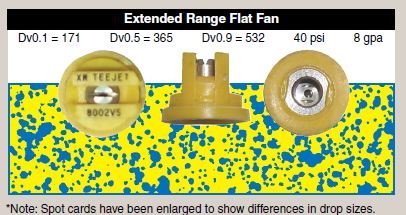 Figures 2 and 3 compare the differences in drift between a flat fan and a drift-reducing venturi nozzle. Pressure loss across the length of the boom may cause variation in the discharge from nozzles, so checking operating pressure along the boom is important to ensure it is uniform and at the nozzle manufacturer’s minimum pressure. Low-drift nozzles are designed to produce larger spray droplets with fewer driftable fines. Larger droplets are produced with the use of a pressure-reducing chamber inside the nozzle and with several nozzles by incorporating air into the spray droplets. These nozzles are excellent at reducing but will not eliminate all drift. You still must use caution when susceptible crops are downwind. Spray coverage is usually decreased when particle drift is reduced by increasing droplet size because fewer droplets will be deposited on the plant. Larger droplets combined with low carrier rates may not provide adequate coverage and could reduce the effectiveness of the application. Low-drift nozzles generally are recommended for use with systemic pesticides that translocate within the plant and usually do not require complete coverage of the leaf surface. Low-drift nozzles usually are not recommended for use with contact-type pesticides. Consult the pesticide label for specific restrictions. Nozzle prices vary widely. Nozzle tips made from stainless steel or ceramic usually cost more than plastic tips but generally last longer. Nozzle designs that incorporate air induction technology also usually cost more than standard flat-fan nozzles, but again, the cost may be worth the extra expense if they prevent drift injury. A drift problem often can cost thousands of dollars, so a few extra dollars for a set of drift-reducing nozzles may be a worthwhile investment. The most crucial factor in reducing drift is the size of the droplets produced by the nozzle. For conventional flat-fan nozzles, the best approach to reducing fine droplets is to increase the nozzle orifice size and decrease the spray boom operating pressure. Another suggestion is to consider using a 110-degree nozzle. It allows a lower boom height and gives the wind less opportunity to carry small drops away even though it produces a smaller drop. Booms should be set as low as possible above the target, based on nozzle discharge angle and nozzle spacing, while maintaining uniform coverage. Check with your nozzle manufacturer to match proper boom height and overlap. The American Society of Agricultural and Biological Engineers (ASABE) provides a Droplet Size Classification System that is a helpful aid in selecting spray nozzles. The classification ranges from extremely fine to ultra-coarse (Table 1). This standard is based on the average size droplet, known as the volume median diameter (VMD), measured in microns, that is produced at an operating pressure. One micron is 1/1,000 millimeter, or approximately 1/25,000 inch. In comparison, a human hair is about 100 microns in diameter. The VMD is a droplet dimension that indicates half of the spray volume is in droplets smaller than this number and half of the spray volume is in droplets larger than this size. It also often is indicated by Dv0.5. Two other important values are the 10 percent volume and 90 percent volume droplet size indicated by Dv0.1 and Dv0.9, respectively. The Dv0.1 value indicates that 10 percent of the spray volume is in droplets smaller than this value and may be a major part of the drift-susceptible fines. For best drift control, this number should be near or above 200 microns, which will help minimize drift. The Dv0.9 value indicates that 90 percent of the spray volume is in droplets smaller than this value, or 10 percent of the spray volume is in droplets larger than this value. A large number indicates excessively large spray drops would be produced and may result in poor leaf coverage or droplets lost to nontarget areas such as the soil. Newer soybean varieties designed for use with glyphosate and 2,4-D or glyphosate and dicamba usually should be sprayed with nozzles that produce an “extremely coarse” or “ultra-coarse” spray drop. This information is based on the Spray Drop Classification System (Table 2). Minor changes in droplet diameter make a big difference in the potential for drift and efficacy. 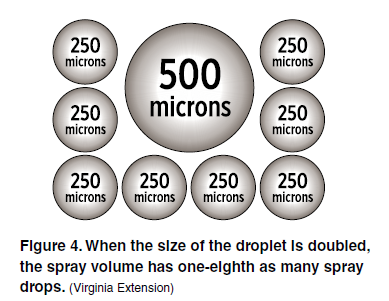 If the size of the spray drop is doubled (for example, from 250 to 500 microns) and the application rate stays the same, the spray volume has one-eighth as many spray drops (as shown in Figure 4) to provide coverage over the leaf surface. The recommended droplet size category to use with a pesticide usually is listed on the pesticide label. Nozzle selection and spray pressure adjustment should be based on the nozzle manufacturer’s droplet-size category charts. Most pesticide labels will list the droplet size category name or symbol and will not list the color code as shown in Table 1. Applicators need to search the label for this information. This color code is not related to the color code indicating nozzle orifice size. Applicators must consider target species, coverage requirements and drift potential when selecting nozzles and resultant droplet sizes. Most pesticides have the recommended droplet size classification listed on the label. 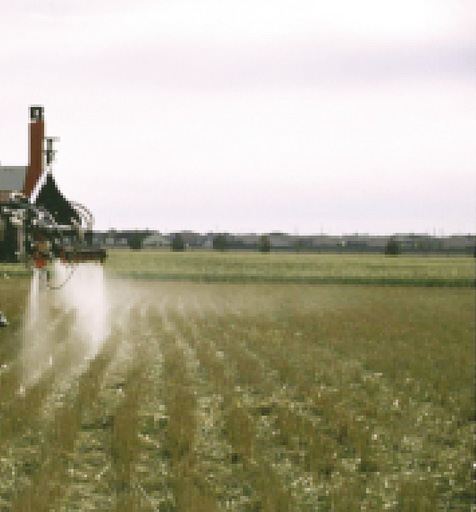 The labels for fungicides, insecticides and contact herbicides often recommend the use of a medium to coarse drop size, while labels for soil-applied insecticides and systemic herbicides recommend larger drops that are more resistant to drift. Some herbicides recommend the use of extremely coarse and ultra-coarse drops for even better drift control. 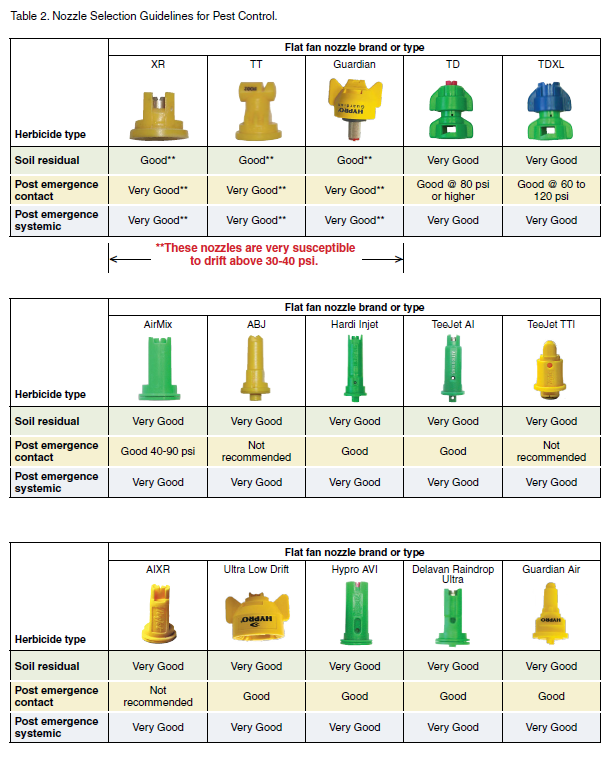 (A nozzle selection guideline for various categories of pesticides is listed in Table 2). Applicators can refer to the spray nozzle catalogs and nozzle tables to select the proper nozzle tip to produce the recommended drop size based on operating pressure, sprayer travel speed and spray application rate. Extended-range flat-fan nozzles are considered the standard nozzle for many pesticide applications in the northern Plains. Variations of this design are available from several manufacturers. The design is available in a wide range of flow rates and fan angles to fit many application needs. A nozzle with an 80-degree discharge angle produces a larger spray droplet than a 110-degree angle nozzle at the same flow rate and pressure. Spray quality is fine- to medium-size droplets for small nozzles. Larger nozzles (0.4 gallons per minute [gpm] and larger) operating at 20 pounds per square inch (psi) are coarse to very coarse. These nozzles produce a uniform spray pattern when patterns are overlapped 30 to 50 percent and when operated at 15 to 60 psi. Most spray nozzles should be mounted about 20 inches above the spray surface when mounted on a 20-inch nozzle spacing. This may vary depending on nozzle manufacturer. Lower pressures and higher flow rates produce coarser sprays that are more resistant to drift, while higher pressures above 30 to 40 psi produce finer droplets that may be susceptible to drift. This is a flood-type spray nozzle with a pressure-reducing turbulence chamber. It produces a wide, uniform spray pattern of 110 degrees with a 15-degree inclination, allowing spray to be directed slightly forward or backward. It should be mounted 20 inches above the target surface when using a 20-inch nozzle spacing. This will provide about 50 percent overlap over the adjoining nozzle spray pattern. This nozzle produces a medium to coarse droplet at moderate operating pressures. It can operate over a wide pressure range (15 to 90 psi), which makes it an excellent choice for use with automatic rate controllers that use pressure to adjust the flow rate in response to a change in travel speed. The optimum pressure is 40 psi. Particle drift can be reduced by 50 percent when operated at reduced pressure with a medium to coarse spray, compared with an extended-range nozzle at equal flow rates. Turbo TeeJet nozzles are a good choice for drift reduction when operated at lower pressures. They produce spray drops that range between the extended-range flat-fan and the air-induction type. However, these nozzles may be difficult to clean in the field, so carry a few extra nozzles when spraying. You will need compressed air to clean the nozzle due to its design. This nozzle is a flat fan-type nozzle with a pressure-reducing chamber that produces a uniform spray pattern over a pressure range of 15 to 115 psi. The wide pressure range makes it an excellent choice for equipment using rate controllers that vary pressure. It has a one-piece design that includes the nozzle, cap, gasket and removable strainer. Commonly used nozzle sizes and pressure ranges will produce medium through very coarse droplets. The nozzle produces a 110- to 120-degree discharge angle with a 20-degree inclined pattern built into the nozzle orifice to allow the spray to be directed forward or backward. Several brands of venturi nozzles are on the market world wide. They also are known as “air induction” or “air inclusion” nozzles. Venturi nozzles have the same basic design feature - two orifices: one to meter liquid flow and the other larger orifice to form the pattern. Between these two orifices is a venturi or jet, which is used to draw air into the nozzle body. In the body, liquid pressure decreases and air mixes with the liquid to form an air-entrained spray pattern. The coarse spray contains large, air-filled droplets and very few drift-susceptible droplets. Venturi nozzles differ from conventional low-pressure spray nozzles by producing coarse droplets with few fines. Most manufacturers of venturi nozzles recommend optimum pressures of 40 to 50 psi and higher for best performance. Be sure to follow manufacturers’ recommendations for operating pressure. Dramatic particle drift reduction has been observed with venturi nozzles while maintaining good spray coverage. The reason is the droplets are filled with air bubbles that cause the droplets to shatter on impact with the leaf, providing better coverage. However, getting the maximum benefit from these nozzles requires the careful selection of the right nozzle for your needs and proper operation. You need to be aware of differences in pressure operating ranges, ease of cleaning and the ability to fit into existing nozzle caps. Most venturi nozzles are designed to be disassembled for cleaning, but the operator may need a needle-nosed pliers, small screwdriver or a piece of fine wire. Cleaning venturi nozzles in the field is difficult because they usually contain some very small pieces that could be lost easily. All brands of venturi nozzles can be installed on any standard spray boom. Some nozzles may require a different nozzle cap, so be sure to check this out when making a purchase. The first venturi nozzle available commercially in the U.S. was the Greenleaf TurboDrop. The exit tip is separate from the nozzle body and can be exchanged with other tips to fit specific needs. For example, a Turbo TeeJet exit tip can be used to increase spray coarseness, widen the spray angle and improve pressure operating range. Exit tips must conform to the manufacturer’s flow rate recommendations. The TurboDrop nozzle produces droplets of intermediate spray coarseness, which vary from medium to very coarse. Good patterns are achieved between 30 and 120 psi, while optimum pressures are 40 to 90 psi. Integrated nozzle caps fit Spraying Systems QuickJet nozzle bodies. The nozzle contains a long-lasting ceramic metering orifice that is easily detachable for cleaning. The Turbo Drop XL is a lower-pressure, all-plastic version of the TurboDrop. Good patterns are produced between 20 and 120 psi. Pressures up to 75 psi provide a coarser spray than the original TurboDrop, while pressures over 75 psi create a finer spray. Optimum pressures are 30 to 90 psi. Optimum drop size classification varies from medium to very coarse, depending on nozzle size and operating pressure. This nozzle produces a larger drop than the XL version and is designed to operate at pressures of 30 to 120 psi. It is recommended for use with 2,4-D, dicamba and glyphosate, the new combination of pesticides for broadleaf control on soybeans. The lower end of the pressure range will produce UC (ultra-coarse) spray drops for use with systemic herbicides. 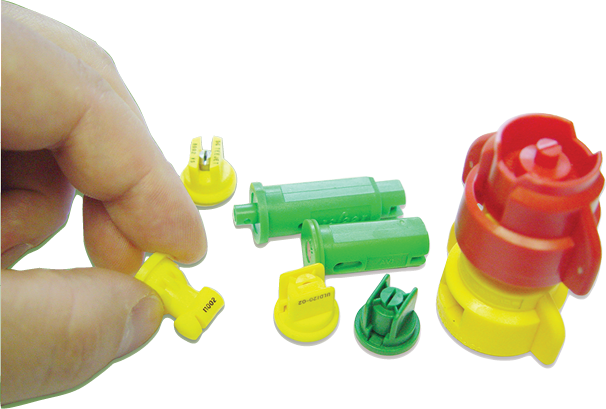 These Greenleaf nozzles contain integrated nozzle caps that fit Spraying Systems QuickJet nozzle bodies and caps. They are best suited for a wide pressure operating range. The Greenleaf AirMix nozzle is a two-piece, all-plastic design that separates easily for cleaning. It operates at a lower pressure than most venturi nozzles, with a suggested range of 15 to 90 psi. Optimal pressure ranges are from 20 to 60 psi. At these pressures, this nozzle produces moderate-sized droplets that are generally finer than those produced by most venturi nozzles. The optimum drop size classification varies from a fine to a very coarse droplet. The spray angle is rated at 110 degrees. Pressures below 20 psi result in rapid pattern narrowing. The nozzle fits standard Spraying Systems QuickJet nozzle caps. This nozzle is all plastic, has a 100-degree spray angle and contains a removable metering orifice for easy cleaning. Good patterns are produced between 20 and 90 psi, and the nozzle is suited for applications requiring a lower, wider pressure range. Unlike many other venturi nozzles, optimum pressures are 30 to 50 psi. This nozzle reportedly produces an intermediate drop size that offers good drift protection. The nozzle caps fit Spraying Systems QuickJet nozzle bodies. This nozzle is all plastic with a removable venturi insert and produces a 110-degree spray discharge angle. A 20-inch optimum boom height is recommended. A ceramic version also is available. Good spray patterns are produced between 40 and 120 psi. Most nozzle size and pressure combinations produce a very coarse-sized spray drop. Optimum operating pressures are 60 to 80 psi. It has a wider body than a standard nozzle and requires a special nozzle cap. Removal of the insert requires needle-nosed pliers. This nozzle is similar in design to other venturi nozzles but has a stainless-steel exit tip. Good patterns are produced between 30 and 100 psi, with optimum pressures of 60 to 80 psi. The nozzle produces a very coarse to an extremely coarse spray droplet, depending on pressure and nozzle size. A special nozzle cap is required to accommodate its wider body. Removal of the venturi insert requires needle-nosed pliers or a short piece of fine wire. This is an all-polymer nozzle that produces a larger drop than the original Turbo TeeJet nozzle. This is due to the internal pressure-reducing chamber and the induction of air into the spray drops. It produces a 110-degree spray pattern and an extremely coarse to ultra-coarse drop size with few fine drops. The pressure operating range is from 15 to 100 psi, with an optimum range of 40 to 60 psi. This nozzle works well to produce the XC (extremely coarse) and UC (ultra-coarse) spray drops for use with glyphosate and dicamba or glyphosate and 2,4-D applications that require a large drift-resistant drop. Lower pressures up to 40 to 60 psi will produce UC drops and higher pressures will produce XC drops. This is an air-induction version of the original XR flat-fan nozzle. It has a pressure operating range of 15 to 90 psi and produces a spray angle of 110 degrees. It produces a much larger drift-reducing drop than the XR flat-fan nozzle, which is due to the pressure-reducing design of the nozzle and the introduction of air into the spray drop. This nozzle produces droplets in the medium to extremely coarse size, depending upon nozzle size and pressure. This is the most compact of the venturi tips and closely resembles a conventional flat-fan spray nozzle. It is an all-plastic nozzle with two pre-orifice openings to meter the liquid through the body of the nozzle. Good patterns are produced at pressures of 15 to 115 psi, with optimum pressures of 40 to 70 psi. Spray droplet size ranges from a medium to an extremely coarse in the droplet classification system, depending on pressure and nozzle size. The nozzle produces a 120-degree angle spray pattern and operates at a slightly wider pressure range than some other venturi tips. It may have more problems with plugging due to the two small metering orifices. Good nozzle screens that are sized properly for the nozzles and are cleaned regularly should eliminate this problem. At lower pressures, this nozzle produces XC and UC spray drops that are desirable for application of glyphosate and 2,4-D and glyphosate and dicamba herbicides. This nozzle has a two-piece pressure-reducing design that contains a ceramic metering orifice along with a ceramic outer orifice that produces the spray pattern. Ceramic provides for long life and uniform flow rate. Uniform spray patterns are produced over a wide pressure range of 30 to 100 psi, with droplet sizes in the coarse to extremely coarse range. This nozzle produces a 110-degree spray angle that should be mounted at an optimum height of 20 inches and with a 20-inch nozzle spacing. This nozzle is available as an all-plastic type design with a stainless steel outer orifice. It produces a 110-degree spray pattern with a pressure operating range of 30 to 80 psi. This nozzle generates a coarse to extremely coarse spray drop. The venturi orifice is removable for cleaning, and the nozzle body fits Spraying Systems nozzle caps. This nozzle is a recent addition to the U.S. market and is based on the Amistar nozzle that is used in Europe. It is a 110-degree, all-plastic design that incorporates a 10- to 13-degree (depending upon nozzle size) rearward inclination to the pattern. It is reported to produce a slightly smaller droplet than other air-inclusion nozzles. Pressures range from 15 to 90 psi, with expected droplet sizes of medium to extremely coarse. The pulsating spray system is designed to provide independent control over nozzle pressure and flow rate. This is accomplished by using a rapidly pulsing solenoid within each nozzle body to vary the amount of time spray is flowing to the nozzle. Operating pressure does not change with travel speed, so a low pressure, which will produce few driftable fine spray drops, can be used. Nozzles are paired so that when one nozzle is off, the nozzles on either side are on, preventing skips. Drift-reduction benefits come from using larger-orifice nozzles to produce larger droplets at lower pressures while allowing lower application rates by varying the duty cycle of the solenoid. Systems that may be operated manually or used in conjunction with a rate controller are available. They allow a constant application rate and droplet size over varying travel speeds. These units are available on several brands of equipment, or retrofits of previously purchased equipment can be done. These systems are not designed to be used with air-induction nozzles. Most of the drift-reducing nozzles provide excellent performance over a wide range of operating pressures; however, some air-induction nozzles require operation at pressures of 60 to 80 psi to provide optimum drift protection. Using lower pressures with these nozzles may cause the air induction system to not work properly. Follow nozzle manufacturers’ instructions. Check the operating pressure of your sprayer and the ability of your pump to operate at higher pressures. Consider replacing the pump or use one of the nozzles that produce a desirable drop size at lower pressures if your spray system has trouble exceeding 60 psi. When using an automatic flow regulator, monitor boom pressure and sprayer output closely when changing speeds. Poor spray patterns are often the No. 1 reason for performance complaints. Most of the newer nozzles will produce a good spray pattern, even at low operating pressures. For best spraying results, check pressure at the nozzles to ensure minimum pressure and uniformity. Because some venturi nozzles should be operated at pressures of 60 psi or more, you may need to choose a nozzle with a smaller orifice (compared with conventional nozzles) to maintain the correct spray volume without increasing travel speed. For example, if you use a flat-fan 0.2 gpm size nozzle at 40 psi, a venturi nozzle of 0.15 gpm operated at 70 psi will provide the same flow rate, produce much less drift and give you some pressure flexibility if you need to slow down. If you use a flat-fan 0.3 gpm tip at 40 psi, conversion to a 0.25 gpm nozzle at 60 psi or a 0.2 gpm nozzle at 90 psi will give the same flow rate. Check the manufacturer’s guidelines for recommended pressures, and calibrate your sprayer at the start of every season and during the season as well. Proper boom height allows uniform overlap and coverage of the spray pattern, and your spraying equipment should be adjustable easily to meet changing conditions. Check with the nozzle manufacturer to ensure proper boom height. Although many venturi nozzles are sold as 110-degree fan angles, their spray pattern sometimes is closer to 80 degrees and quickly becomes narrower at lower pressures. This is because the exit tip has a greater flow rate than the metering orifice, causing a significant pressure drop at the outer orifice, which narrows patterns. Even at a gauge pressure of 80 psi, the exit tip pressure may be only 20 to 40 psi. Watch patterns carefully, and set your boom at the height needed to achieve proper overlap. Most venturi nozzles are plastic. Plastic has very good wear characteristics and sometimes can outlast stainless steel. However, plastic is prone to deformation if cleaned with hard objects such as fine wire or a knife tip. You should use a soft-bristled brush, such as a nozzle-cleaning brush or a toothbrush. Nozzles occasionally will plug, even with clean water and screens. A venturi nozzle should present less plugging problems than conventional nozzles because the metering orifice is round, allowing larger particles to pass through. The exit orifice typically has about twice the flow rate of the metering orifice, reducing the likelihood of plugging. If this orifice plugs, the nozzle will have to be taken apart for cleaning. Venturi nozzles sometimes are difficult to disassemble, especially in the field, and nozzle parts can be lost easily. Your best option may be to carry extra nozzles and disassemble and clean the plugged ones at the shop, where you have compressed air and water. Some adjuvants are marketed to improve spray deposition on intended targets and reduce spray drift. Some viscosity-modifying, drift-reducing adjuvants should not be used with venturi tips because the spray may not atomize and form droplets properly, thus, decreasing droplet size. Always read the pesticide and adjuvant labels for restrictions before use, and check your spray pattern after adding any adjuvant. Venturi tips are best known for their dramatic ability to reduce drift. Initial data suggest that these tips perform well at conventional carrier volumes, travel speeds and product rates when used with systemic herbicides. Situations such as low carrier rates, reduced pesticide rates, contact pesticides and small weeds under heavy canopies may see reduced control with air induction nozzles. Manufacturers of spray nozzles have selection guides, available on the company website or in a nozzle catalog, that can be helpful in selecting a nozzle for a specific application. Some weeds are more difficult targets than others, particularly the difficult-to-wet weeds, such as lambsquarters, wild oats and green foxtail, or small weeds under a dense canopy. Sprays with finer droplet sizes may help maintain effective coverage, but finer drops do not penetrate thick plant canopies as well as larger drops. When using venturi nozzles on these weeds, make sure you have adequate carrier rates to ensure you have enough droplets to provide good coverage deep into the canopy. Larger weeds and reduced product rates typically make chemical control more difficult, and these conditions also may reveal some performance differences among nozzles. Most nozzle manufacturers rate their nozzles based on the droplet size classification chart discussed earlier in this publication. Some pesticide manufacturers list a recommended spray drop size on the label that performs best with their product. Follow these guidelines and you should obtain the best application job possible. Low-drift nozzles are classified by the manufacturers, and using the recommended drop size on the chemical label should produce excellent results with the product. As with any technology, venturi nozzles should be used with caution. They have an excellent capability for reducing drift while maintaining good efficacy, and have been used successfully by many applicators under a wide range of conditions. But they can be used improperly; make sure you pay attention to pressure and your spraying situation before you spray. You should not use venturi nozzles under all conditions. Think in terms of using the “right spray nozzle for the condition.” This means you may want to use conventional tips under good conditions but slow down and reduce pressure, or choose low-drift tips for the outside rounds or when winds increase. Always remember that the label is the law, and if the label states a maximum wind speed for spraying, it should be followed, even when using drift-reducing nozzles. Finer sprays are more appropriate for most insecticides and fungicides and for narrow-leaf weeds. Coarser sprays usually work well for many broadleaf weeds and when penetrating a dense canopy. You also may want to consider having two different flow rates available: for example, 5 gallons/acre may improve performance for glyphosate, and 10 gallons/acre or greater may be required for contact herbicides. Nozzles are the most important part of your sprayer. Investing in the proper nozzle to make sure the job gets done right makes sense. Tom Wolf for the use of information from the publication “Making Sense of New Nozzle Choices.” Agri-Food Canada, Saskatchewan Research Center, Sask. Virginia Extension Service. 2014, Publ. 442-031, “Droplet Chart/Selection Guide.” Virginia Polytechnic Institute and State University, Blacksburg, Va.
Virginia Extension Service. 2013, Publ. 442-032, “Nozzles: Selection and Sizing.” Virginia Polytechnic Institute and State University, Blacksburg, Va.
Arizona Extension Service. 2012, “Nozzles and Droplets: What do the Colors Mean?” The University of Arizona, Tucson, Ariz.
Spot card deposition analysis was conducted using WRK Droplet Scan software. The use of trade and company names does not imply endorsement or preferential treatment of the product by North Dakota State University, the North Dakota Cooperative Extension Service or the USDA. 1Brand names appearing in this publication are for product identification purposes only. No endorsement is intended, nor is criticism implied of similar products not mentioned.